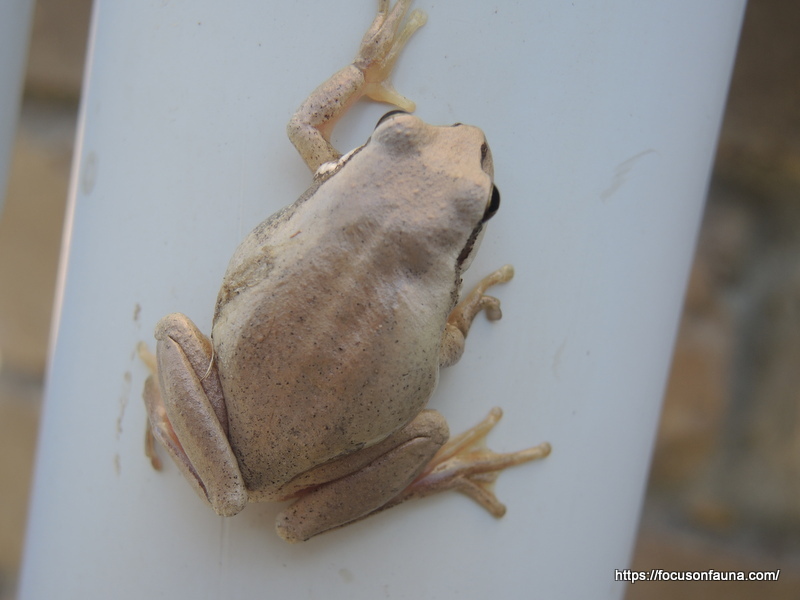 Victorian frogs belong to two families: the Hylidae or Tree Frogs and the Myobatrachidae or Southern Frogs. The tree frogs are so called because they are mostly (though not all) good climbers due to the pads on the end of their digits. They can use their climbing ability to get into some unusual spots. We have PVC pipes split lengthwise that are used to cover some of our solar hot water tubes in summer when not all the tubes are needed. 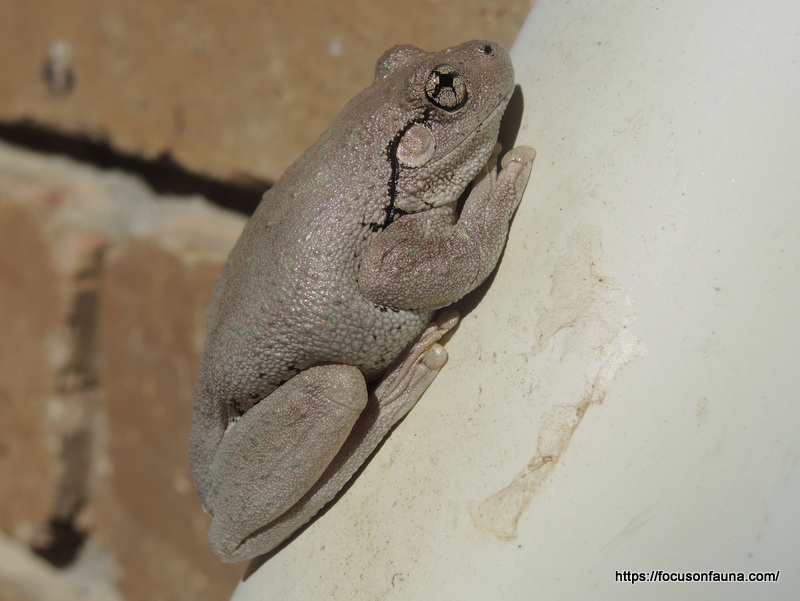 A few of the half pipes were stacked together against a wall and have proved to be a favourite resting spot for two species of tree frogs, Peron’s Tree Frog, Litoria peronii – see above, and Plains Brown Tree Frog, Litoria paraewingi – see photos below. 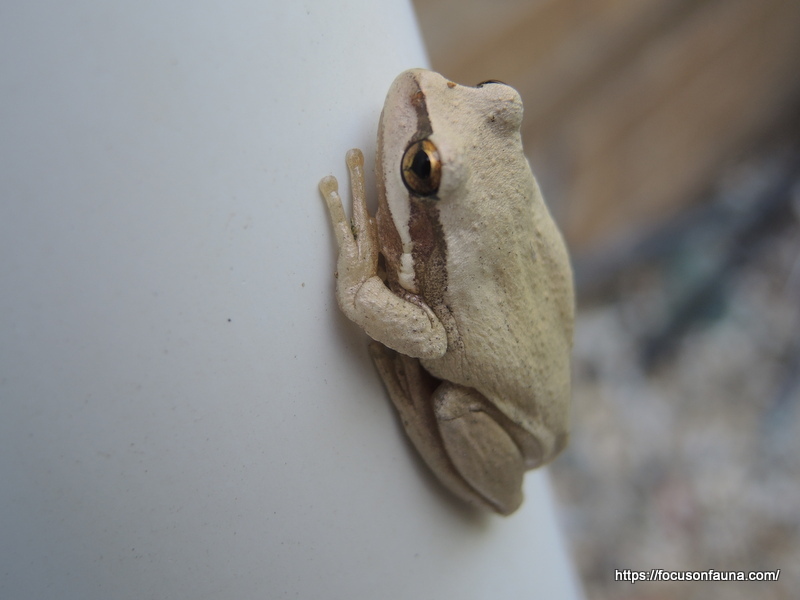 At least we think it’s Plains Brown Tree Frog – a species that is difficult to distinguish from the closely related Southern Brown Tree Frog, Litoria ewingii. The skin markings are variable in both and the main differentiation is in the call and the distribution, although the Plains is reported to be slightly smaller. We have been told that we are in an overlapping zone of the two species, and if the frogs aren’t calling, it makes identification difficult. We hear frogs all the time, but it’s not often we are able to get up close enough for clear photos. This hideout of the frogs between pipes was an ideal opportunity to show some of their identifying features, such as the tympanum (ear), the foot-webbing and digit pads, the eye pupil etc. The Peron’s Tree Frog, for instance, is immediately recognisable by its cross-shaped pupil, if not from its weird call. Now, if only the other little frog had a name-tag!